Is it raining where you live? It certainly is in my part of town. When it rains I jump on the soup bandwagon as it always makes me feel good and warm inside. 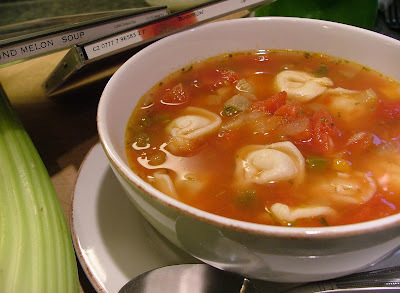 Soup is often thought of as an appetizer yet I prefer it when it presents itself as a hearty meal. 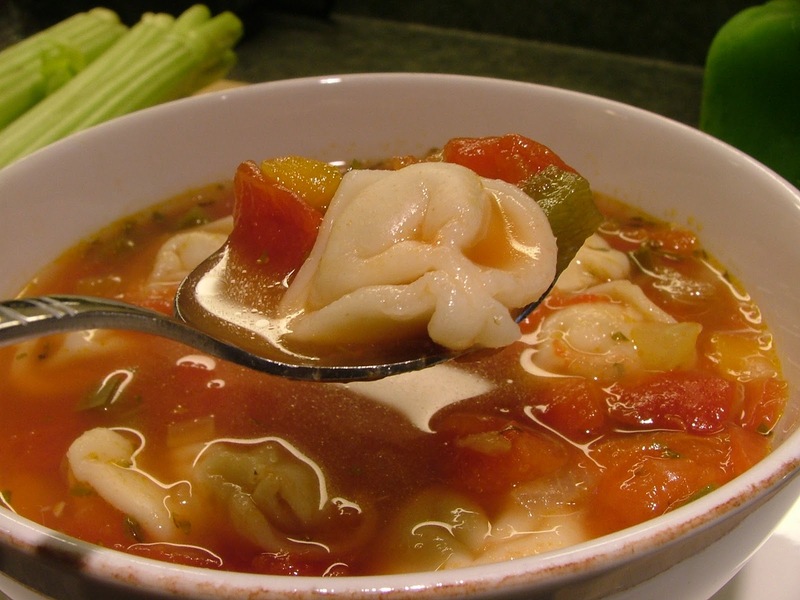 Many of the ingredients found in this soup are from a tortellini pasta dish I often prepare. Instead of tomato sauce I used broth and added a few crunchy vegetables such as carrots, green bell peppers and celery for color and texture. 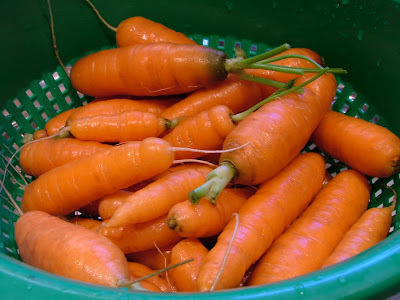 I was lucky enough to still have carrots from my garden to include in this soup. They have a certain sweetness that I’ve never experienced from the store bought variety. During rainy days I also break out the tunes to help overcome the dreary weather. Since the wet weather has been hanging around like a bad cold, I listened to a song with a title that expresses what I would love to hear from the weather forecasters right now. “No Rain” by Blind Melon. The irony is the song lyrics don't quite mesh with my thoughts as the late Shannon Hoon sings he is complaining there is no rain. The song still set a chilled-out and mellow cooking mood, which I enjoyed. I also dipped into songs from their aptly named “Soup” CD to round out the whole music infused cooking experience. If you enjoy a hearty soup filled with colorful vegetables and floating pasta dumplings then this soup may fit your style whether you love the rain or not! In a medium saucepan, cook tortellini according to package directions. Drain and set aside. In a large saucepan, heat oil over medium heat. Add carrots, bell peppers, onions and celery. Cook and stir until vegetables begin to soften, about 5 minutes. Add garlic, basil, oregano, salt, pepper and red pepper flakes. Cook and stir for 1 minute more. Add tomatoes and vegetable broth to saucepan. Bring to a boil. Reduce heat and simmer for 10 minutes. Nice to meet you Brent! Oh how I love soup and yes it has been very rainy in my neck of the woods too. Perfect soup weather and yours looks fantastic. I love me some tortellini. Enjoy the mango milkshake! I am making a mango smoothie for my Halloween lychee eyeballs today. Talk about mango madness!